Back in 2009, I sat in a diner in New Mexico with nothing to do. The kitchen wasn’t prepared to deal with the sudden flood of patrons. The waitress told me that my food would take about an hour to get to me. I had a solid-wood Kamaka ukulele in my truck. It was morning, but also summertime in the desert. I figured the uke would be fine. The day was early. I’d be out of the diner and my truck’s air-conditioner would cool the ukulele before the day’s heat really set in. Still, I had the ukulele on my mind. I also had Melville on my mind because I’d just finished classwork for my doctorate. The last class I took was on Melville. I love his fiction. His biography is pretty compelling as well. In my boredom, I took out a notepad and started writing a story about Herman Melville and his ukulele. Of course, Melville died before the first ukuleles were brought to Hawaii. I didn’t care. The beauty of fiction is that it can transcend the tyranny of clock time. Or, put another way, I love fiction because I can make up whatever I want. Anyway, my Melville ukulele story ran in a recent issue of the literary journal Fjords. For a short time, Fjords is making the journal free for electronic download. If you want to check out the story and the rest of the journal, you can download it here. 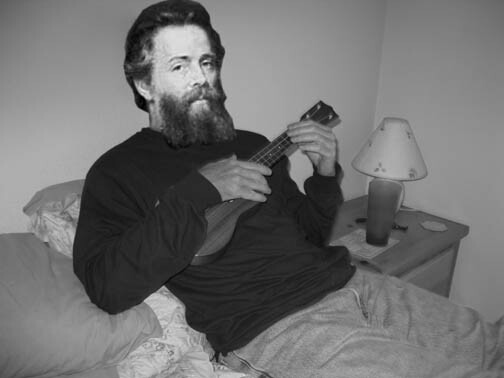 Oh, and finally, that above picture of Melville playing a uke is absolutely authentic.